Add a secondary VGA display to your USB 3.0 enabled PC, and install the drivers without a CD or Internet connection. 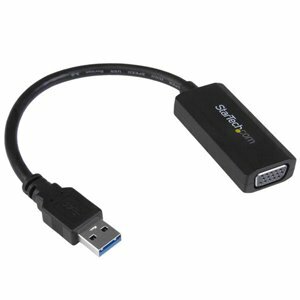 This USB 3.0 to VGA video adapter works as an external video card, enabling the USB port on your computer to output video to a VGA display at 1920 x 1200 resolution. The adapter also features on-board driver installation, which means the adapter will work when you connect it, even without a software disc or Internet connection.For the ultimate in hassle-free installation, this USB video adapter features on-board drivers which prompts for installation as soon as you connect the adapter to your Ultrabook or laptop computer. This means you can maximize portability by never requiring an installation disc or Internet connection to install the device.Adding a second or third display to your computer can vastly increase your productivity by giving the freedom to access more applications at the same time. This video adapter is intended to support all of your business applications including web browsing, e-mail. spreadsheets and presentations. You can also leave your system video card available for more demanding applications such as gaming or CAD design, while you use the USB monitor for reference material.Using the high-bandwidth USB 3.0 interface, this adapter enables smoother scrolling through documents, higher refresh rates and an overall enhanced performance over USB 2.0. The adapter is optimized for use with USB 3.0, but for added compatibility this adapter is also backward compatible with USB 2.0 computer systems supporting an 800 x 600 resolution at 60Hz. For the ultimate in hassle-free installation, this USB video adapter features on-board drivers which prompts for installation as soon as you connect the adapter to your Ultrabook or laptop computer. This means you can maximize portability by never requiring an installation disc or Internet connection to install the device. Adding a second or third display to your computer can vastly increase your productivity by giving the freedom to access more applications at the same time. This video adapter is intended to support all of your business applications including web browsing, e-mail. spreadsheets and presentations. You can also leave your system video card available for more demanding applications such as gaming or CAD design, while you use the USB monitor for reference material. Using the high-bandwidth USB 3.0 interface, this adapter enables smoother scrolling through documents, higher refresh rates and an overall enhanced performance over USB 2.0. The adapter is optimized for use with USB 3.0, but for added compatibility this adapter is also backward compatible with USB 2.0 computer systems supporting an 800 x 600 resolution at 60Hz.